The House and the governor’s budget numbers are, relatively speaking, within spitting distance of one another—just half a billion dollars separate their targets. The Senate? They’re a little farther away than that. The Senate’s $47.6 billion proposal, released March 28, offers state government about $2 billion less money than that body’s closest rival—Gov. Tim Walz. His $49.4 billion budget, meanwhile, is just a tad less than the House’s $49.8 billion budget target. Senate leaders promise a balanced budget with no tax increases and no new fees. 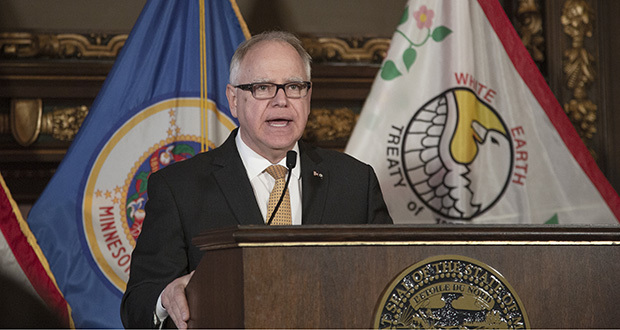 They let the 2 percent provider tax die at the end of the year and shrug off Walz’s suggested 20-cents-a-gallon gas tax increase. But the Senate also raises appropriations in a few areas, including its combined judiciary and public safety finance division. That gains $38 million in the Senate targets compared to what was allocated at the start of the last budget cycle. The Senate’s total for that division is $2.38 billion over 2020-21. That’s less than Walz or the House is offering in those areas. The House this cycle has split its Public Safety and Judiciary Budget into two budgeting divisions; in the Senate they remain combined. The House allocates $2.6 billion to those combined areas, while the governor proposes nearly the same amount. At a March 28 press conference, Senate Majority Leader Paul Gazelka, R-Nisswa, said he would leave it to his Judiciary and Public Safety committee chair, Sen. Warren Limmer, R-Maple Grove, to figure out where to spend that money. “But we know that we want to emphasize corrections,” Gazelka said. That indicates the Senate might fund more new corrections officers for the state’s prisons—a priority issue since the death of Stillwater corrections officer Joseph Gomm, allegedly after an attack by an inmate. During his own March 28 press conference, Walz said he hadn’t yet studied the difference between the DFL and GOP Senate public safety/judiciary proposals. But he suspects the difference might be in areas within corrections like mental health, chemical dependency and opioid treatment, which he suspects the Senate might be shortchanging. The House and Senate have already posted their public safety and judiciary budget bills. The Public Safety and Criminal Justice Reform Committee, chaired by Rep. Carlos Mariani, DFL-St. Paul, held its initial budget walk-through hearing on April 2. House Judiciary, chaired by Rep. John Lesch, DFL-St. Paul, was scheduled to follow suit on April 4. As of this writing, the Senate Judiciary and Public Safety committee has not scheduled its initial budget walk through.